The boys love to make things and are always sticking or colouring in something whether it be drawing animals of making spaceships the boys love to craft. So you can imagine my delight when an email popped up in my inbox from Yellow moon an online art and craft shop asking me if the boys of I would be interested in joining their blogging network, they would send us some crafts and the boys have to make them and then all I have to do is share their creations with you all, fabulous. 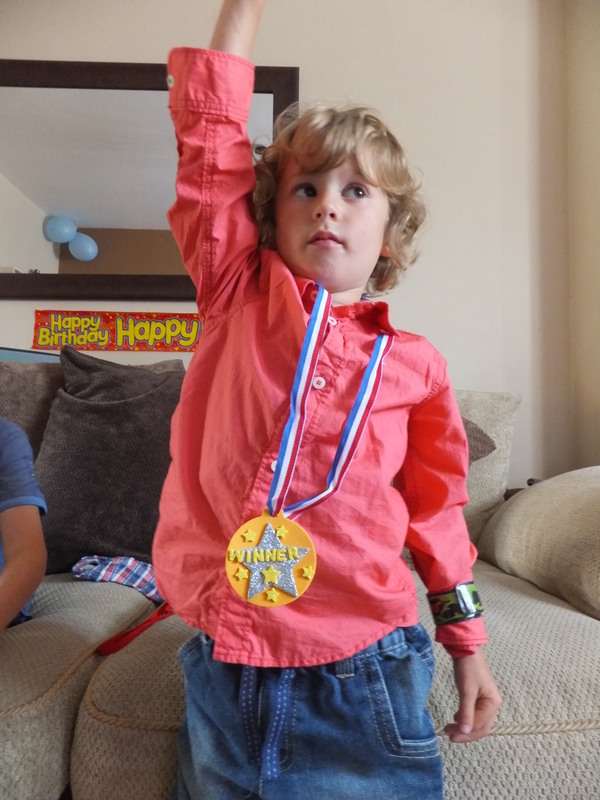 We received our first box of crafts last week and the boys were very happy to see that all the crafts that was sent to them was olympic/sport themed, seeing as they have been glued to the television watching the olympics i thought they would really enjoy making some of their own medals and their very own supporters hand to wave when watching the olympics. With Summer already here the time is right for thinking about getting the kids excited about a season of sporting fun with the Olympics being held only miles away from where we live. Yellow Moon have all the summer sports craft ideas you need to prepare some super sports-related activities for the children. The boys were very excited when they saw what they had received and couldn’t wait to get stuck in and start making things. Joseph had taken everything out of the box and was ripping at the foam hands pack to open it, i enjoyed watching him excited as he never used to be interested in art and crafts but just recently i can’t stop him from going down the craft drawers we have in the cupboard and getting out some paper and glue to make something with. I am always encouraging him in a good way to use scissors in order to develop his fine motor skills and cutting out shapes his a great way to do this. 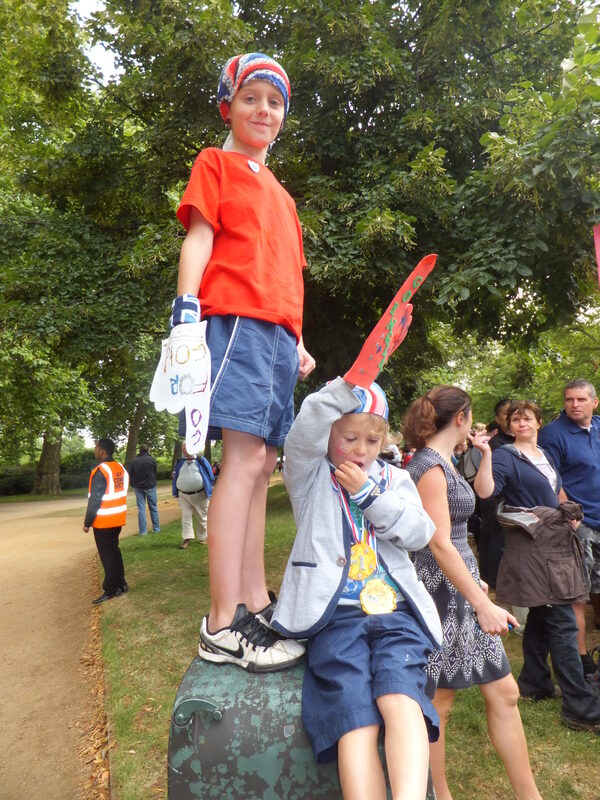 The first craft the boys decided to do was the foam hands, we was going to watch the mens Olympic Triathlon at Hyde Park and thought this would be a great place to wave their creations. The foam hands are already made and ready to place your hand inside all you have to do is decorate it the way you want to using glitter or stick-ons. The boys used the felt letters and the glitter pens to create two brilliant hands (if i say so myself) to wave at the athletes as they passed. 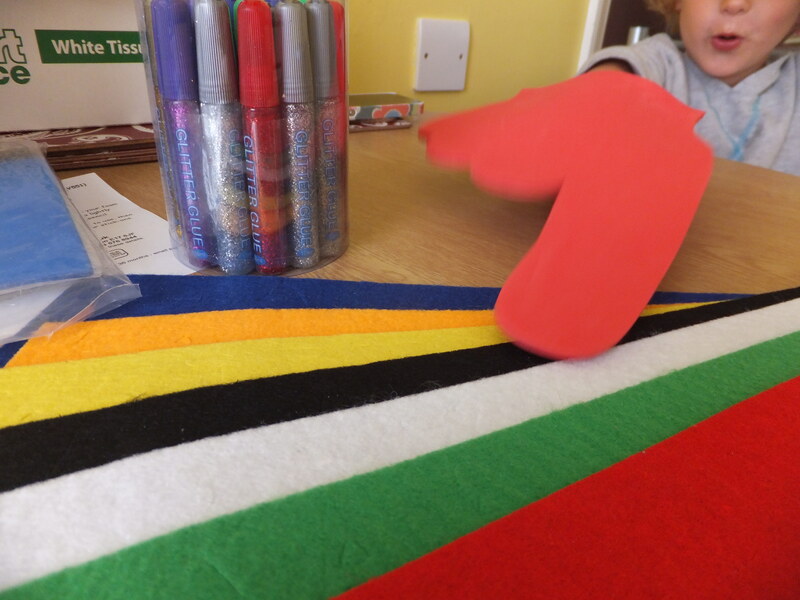 The felt letters came in 7 different colours to choose from and was easy to peel away from the sheet even for Josephs little fingers. 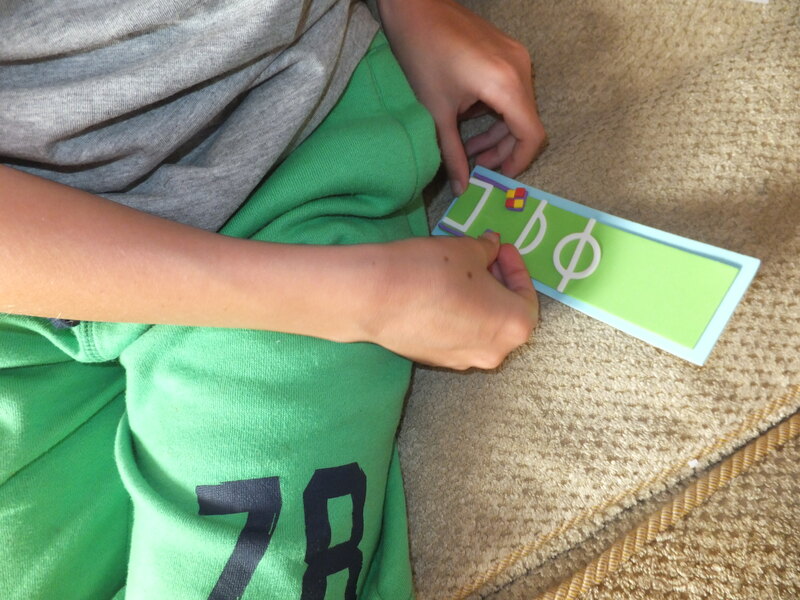 The letters are self adhesive which is ideal with my boys because when they use glue they can make lots of mess and end up sticking glue everywhere. The glitter pens were easy to squeeze and the boys had a choice of 6 colours to use and with four of each colour there are lots to go around and should last for quite a while. I like how they come in a handy little storage pot so there will always be a place for them and the boys won’t be just throwing the pens in the craft drawer causing lots of mess. The foam hands are a great way of showing how creative you are by adding your design on it using pens or even gems. Next up they made some of their own medals to wear , the pack comes with 6 medals with 3 different choices to make. 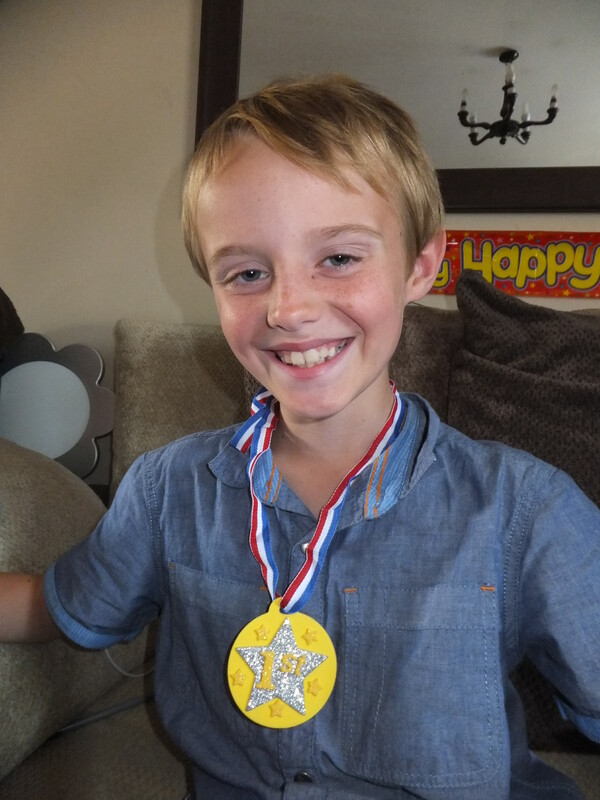 Joseph chose to make the ‘Winner’ medal, Jak made the ‘1st’ medal and I made the ‘1st’ medal. 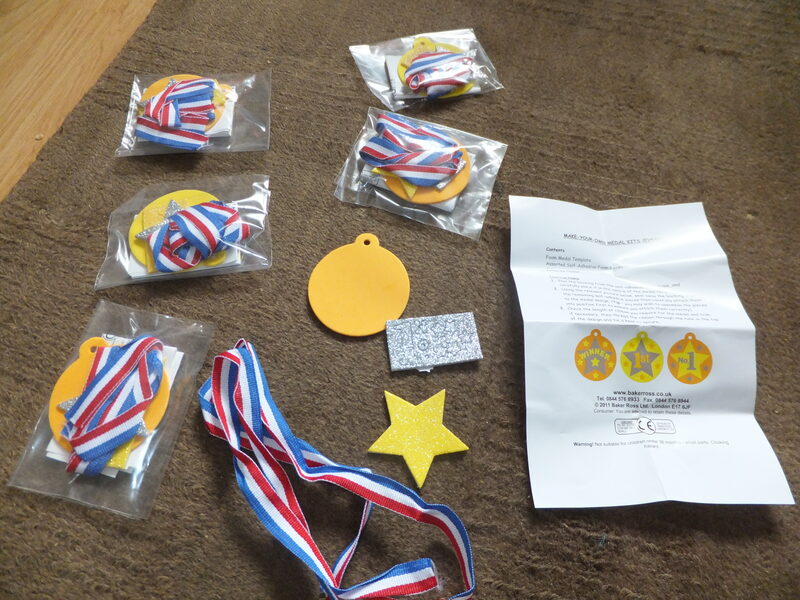 Each medal kits comes with a foam medal template, self adhesive foam letters and stars and some coloured ribbon to tie the medal around your neck. The medals are very glittery and whats great is the glitter doesn’t come off when rubbed so there is no mess from these too, BRILLIANT! 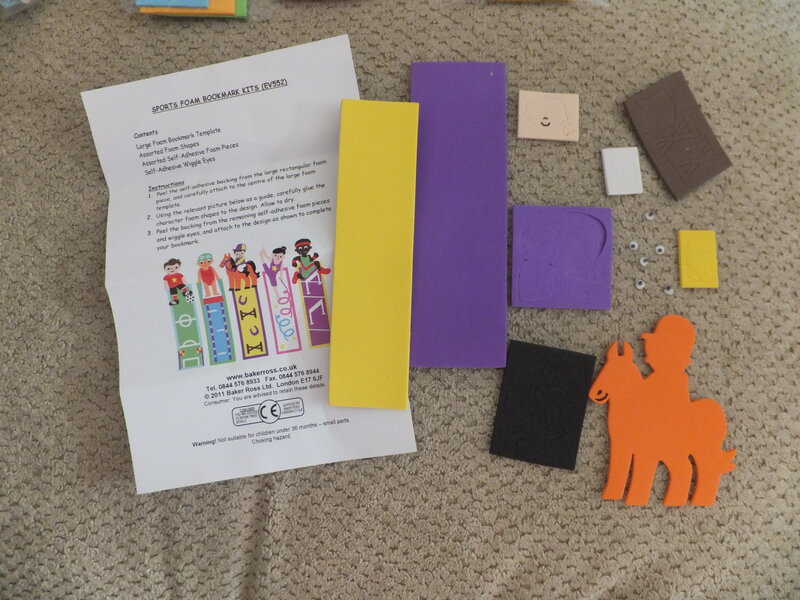 These craft kits from Yellow Moon are fabulous ideas for the children, they keep them occupied for ages especially through the school holidays and each pack comes with instructions on what to do which are easy to follow and even have end pictures of what the kits should like when finished. Jak found them easy to follow and at times didn’t even have to read the instructions he just used his imagination and got on with it. Jak really enjoyed doing the sew your own Union Jack keyrings, he got a chance to put some of his sewing skills to the test, this craft wasn’t easy for Joseph to do especially the stitching but he still enjoyed the activity by sticking the union jacks on to the cushion and now wears it with pride. This craft activity was Jak’s favourite one and he really liked the fact that they are cushion like key rings, Joseph says they are all soft and cuddly. I think they would make lovely little presents for the children to give to the family and fabulous keep sakes. Every kit comes with everything needed to make the activity so nothing else is needed. The last activity that the boys enjoyed doing was the Sport foam bookmarks, this is great for Jak as he loves to read and now has his very own bookmark to keep in his book on the page that he is reading also I am hoping that Joseph having a bookmark of his own will encourage him to read more often. The boys have had lots of fun doing these activities and they have definitely kept them busy on days that I had nothing planned for them. There are many different crafts that can be bought from the www.yellowmoon.org.uk like paints, stickers, coloured elastics and they also sell party bag goods and games. If your order comes under £20 there is a cost of £2.20 for delivery but anything over £40 the delivery is free and should be with you in 3- 5 days. Not only are the craft kits fabulous to have indoors for the children but are a great addition for any classroom in the schools to be using. At brilliant prices and excellent products why not get creative with Yellow Moon. I was sent these products for review purposes only and all of the words in this post are of my own.